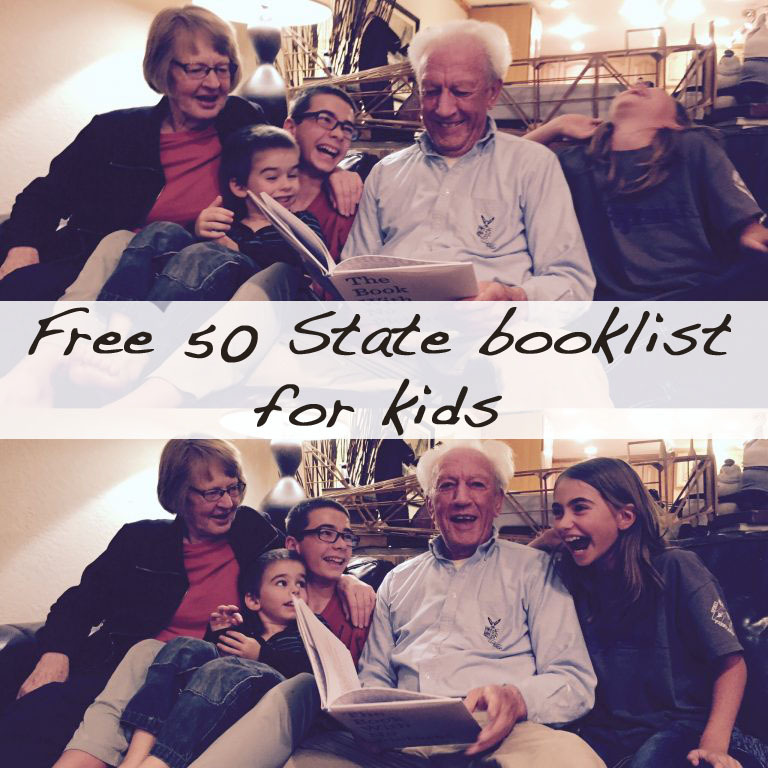 Last month I completed my project to curate a book list of over 300 children’s chapter books organized by the state they take place in. 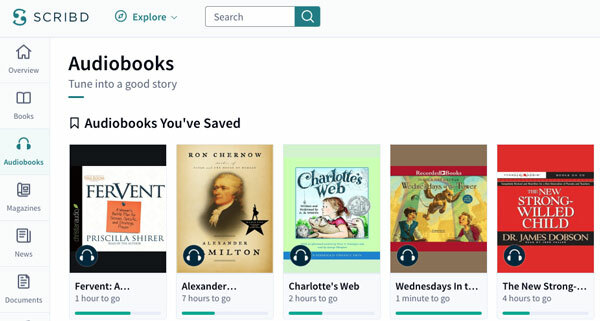 I wanted to create a resource that we could use as we traveled across the US allowing us to choose books to compliment the places we were visiting. (By the way, if you haven’t gotten your copy of this book list, simply subscribe to my blog email list and I’ll send you your own copy lickity split). While researching books for my state book list, I came across something that I got really excited about. Someone had written a series of books about an RVing, roadschooling family who travels the USA! 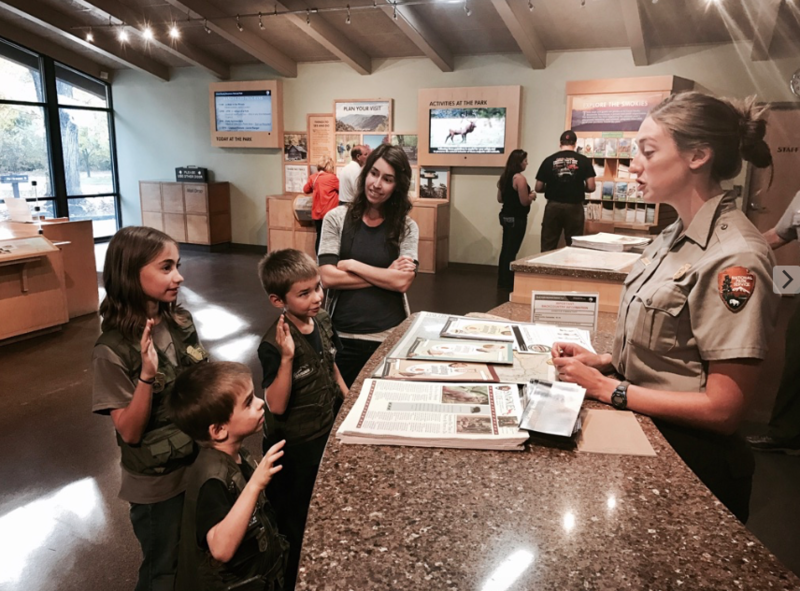 A RV, ROADSCHOOLING BOOK SERIES?! 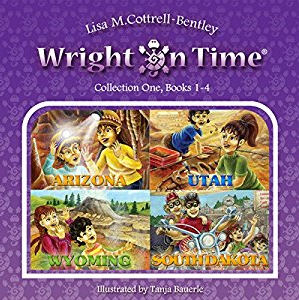 Each book in the Wright on Time series takes the family to a different state each with a new educational adventure. The series (which currently covers 6 different states) is tied together with a fun sci-fi mystery. I couldn’t believe how perfect this was for my booklist. Not only were they a great fit, but these were the first books I’ve ever come across that are written about a full-time RVing family! 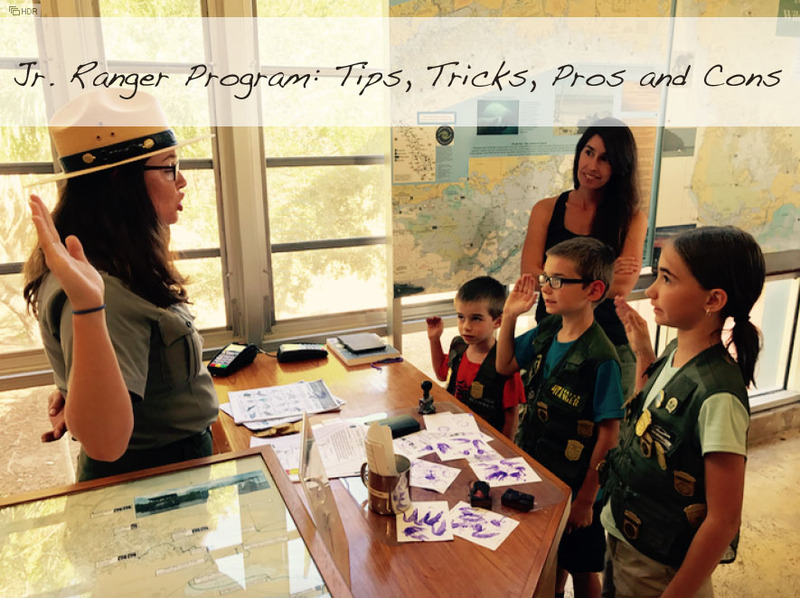 Even if you are not traveling in an RV, I believe your kids would enjoy learning from a family who does. 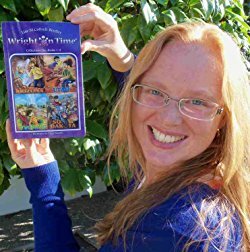 I contacted Lisa Cottrell-Bentley, the author of the Wright on Time series and told her how excited I was to find her books. 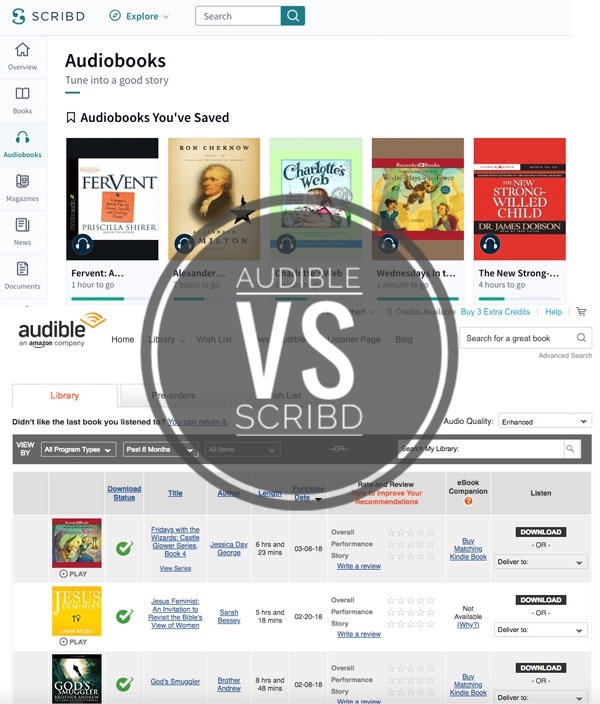 Together, we decided to offer you a chance to win her Wright on Time book collection (of books 1-4) in either the Audible format which contain 5 hours and 47 minutes of listening time or the Kindle versions of books 1-4. Curious about what the first four books focus on? Book 3: Wright on Time: Wyoming the family explores various alternative energies. Book 4: Wright on Time: South Dakota the family goes to the Sturgis Motorcycle Rally and also learns about how newspapers are made. Below you have multiple options to enter to win this 4 book series by Lisa Cottrell-Bentley. 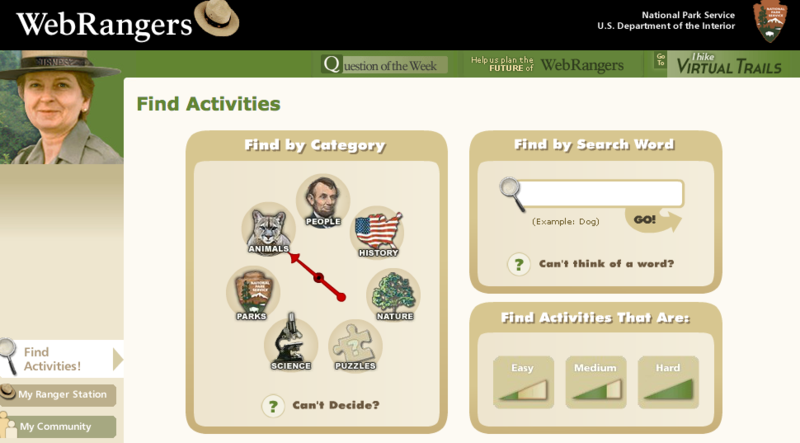 The Rafflecopter form will offer you several ways to enter. You can sign in using your facebook login or with your name and email. It is necessary for us to have your email so we can contact you if you are the winner. Your email address will not be used for any other purpose. The winner will be chosen at random and contacted via email within 48 hours with your prize details. 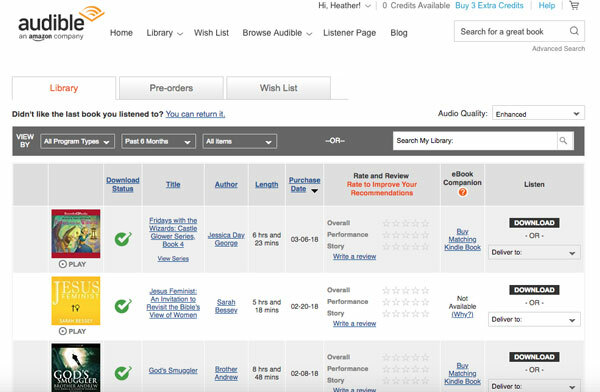 The Wright On Time book series (books 1-4) will be sent via Audible or Amazon Kindle (according to the winner’s preference). The giveaway begins on December 17 and ends December 21, 2016. 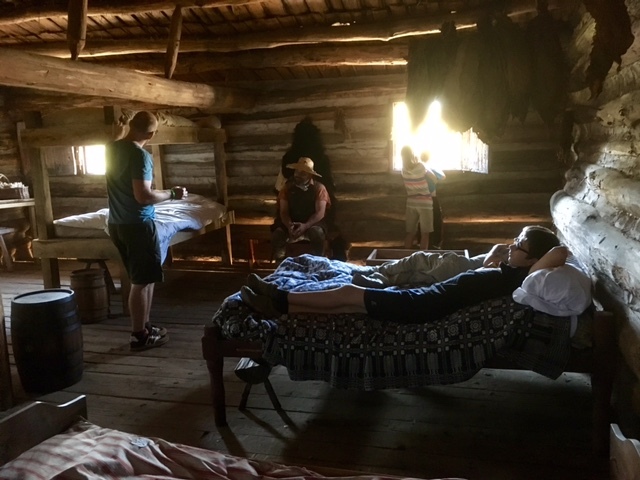 This week we dipped our 21st century fingers into the pot of the late 1700s past to test and try to understand what it was like to live in a fort forged by men who were masters of skills that most of us don’t even have the vocabulary to explain. 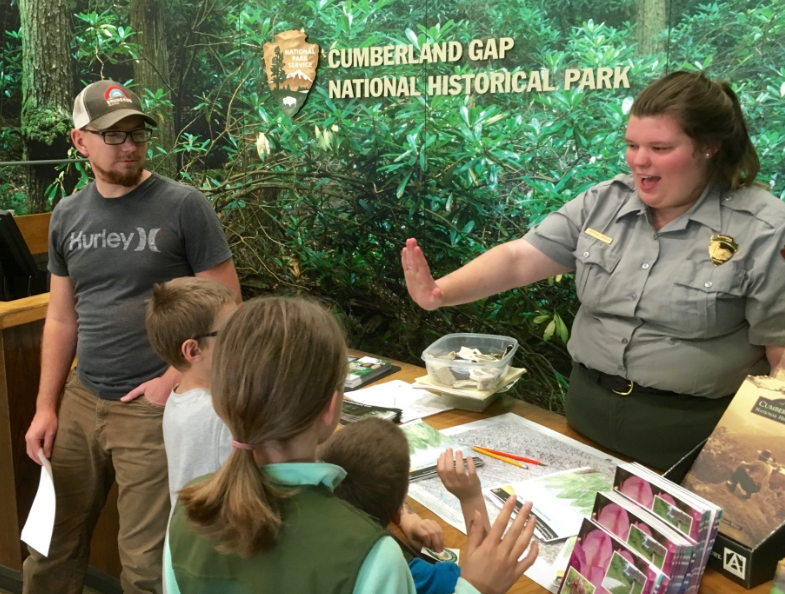 Stopping at Historic Manskers Station, just 20 minutes north of Nashville in route to Kentucky, was an ideal way to sample this life of the past. 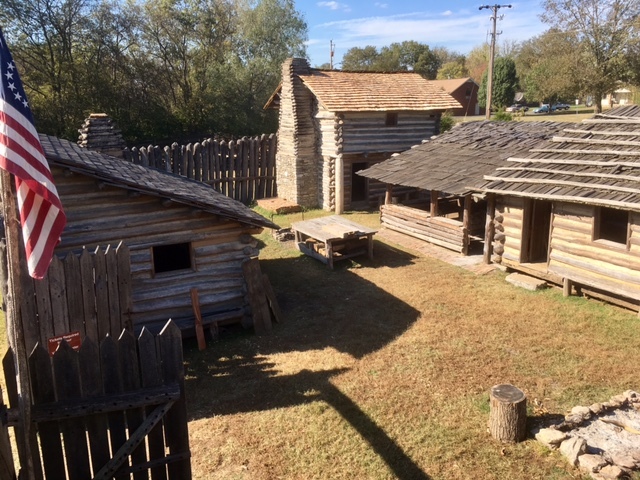 According to some online reviews, we anticipated costumed interpreters and expected to spend about 1-2 hours touring the recreated fort. We arrived just after they reopened from the one hour lunch break at 1:00 and discovered, much to our delight, that we had the place to ourselves. 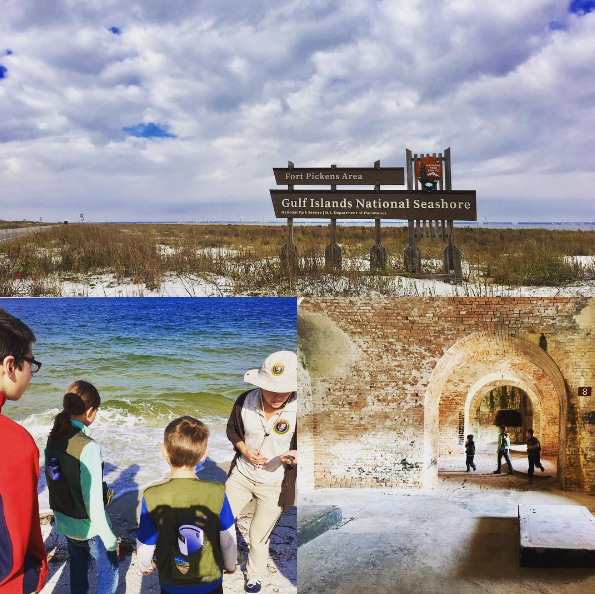 Upon our entrance to the fort, we were met by a burly mountain of a man who was enthusiastic not only about the fact that we were homeschoolers (“they ask the best questions,” he said), but about his historical knowledge. Like a pot of well warmed soup, he bubbled over with bits of information and interesting tidbits while showing us around. Any questions we asked were met with a knowledgeable answer. Kicking back, letting our guide fill our minds with knowledge, while tobacco leaves hang from the ceiling to dry. The difference between a station and a fort (while they are often used interchangeably, the former typically refers to a settlement of civilians while the latter usually indicates a military presence). How to card wool by hand. Where the term “nit-picking” came from (picking out small impurities from the wool–best accomplished by small fingers). The origin of the term “sleep tight” (from the desire to keep rope supported beds snug and firm). Learning the correct technique for carding wool by hand. 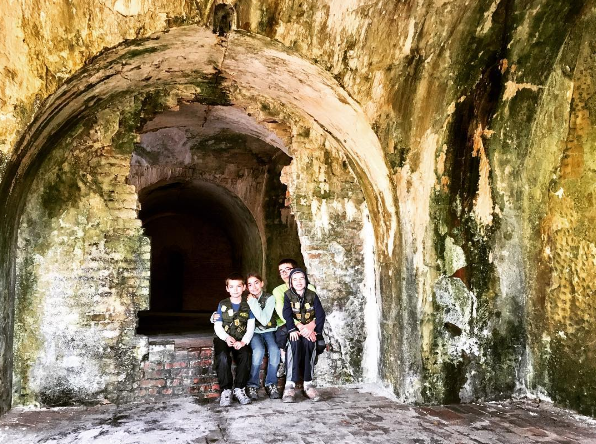 About 1/2 way through our tour we met a second guide who continued our deluge of learning. 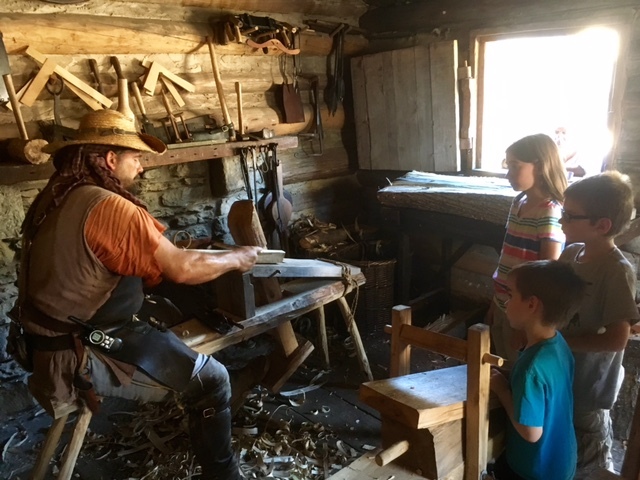 This time we received an education and demonstration of the importance of the local blacksmith. The video below shows our children trying their hand at keeping the blacksmith fire burning. That iron nails were so important at that time houses were being burnt to the ground in order to retrieve and reuse nails for future building projects (until an ordinance was passed outlawing this potentially dangerous practice). 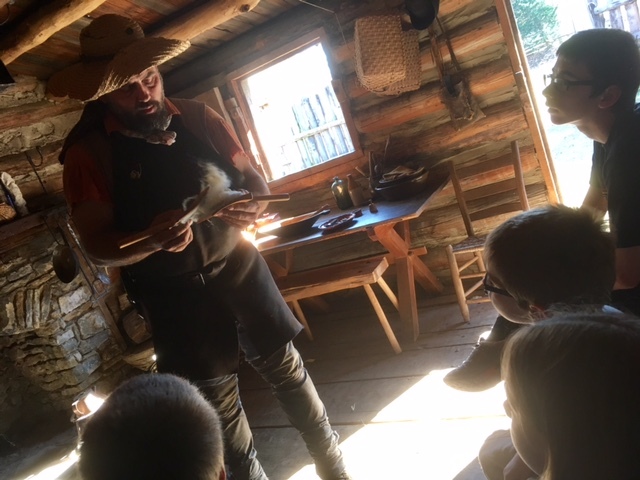 Blacksmith apprentices began their education around the age of 8 when they would move out of the house and live under the blacksmith’s tutelage. The 8 primary skills that a blacksmith obtains as he hones his skills. Often the blacksmith would also be called on to be your dentist! The shave horse was so named because the silhouette of a person using it would resemble that of a horse rider. Switching back to our initial guide, we were invited into the woodworking shop for a demonstration of his lathe (see the video below) and shave horse skills while explaining details of his craft and tools. The kids were invited to partake in some of the activities (sans sharp objects). 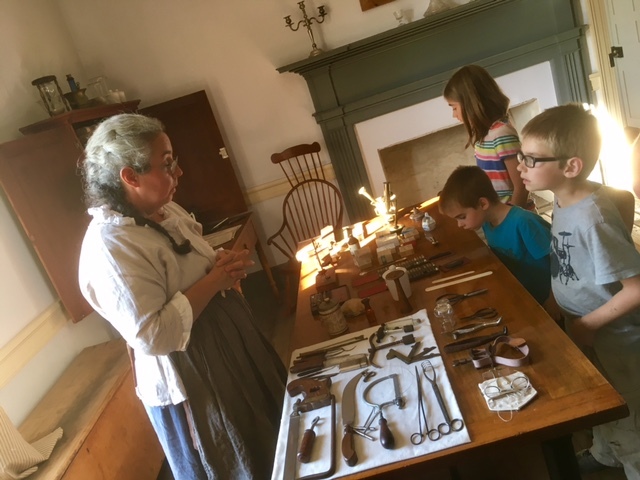 Next we were escorted into the nearby 200-year-old Bowen Plantation home (the longest standing brick structure in middle Tennessee) and given a tour and explanations of various antique medical equipment (because the home was at one time owned by a doctor). In addition, we were given a demonstration of various textile machines for the development of fabric from hemp, cotton and wool. It was also here that we saw our first cotton plants in bloom and had the chance to attempt seed removal by hand (think cotton wrapped around velcro). The afternoon was a plethora of one-on-one experiential learning. Examining the doctor equipment (including the skull drills). Overall our experience was fantastic. I could not have asked for a better value for the time, knowledge and expertise demonstrated through their patient staff. I’d highly recommend stopping by for a visit should you find yourself in the area, you won’t be disappointed. Nearby: Mansker’s Station is located adjacent to a park which we intended to visit but ran out of time. This would be a great place to eat if you happen to come during the 12-1 hour that they are closed or just to let your kids burn off some energy. Parking: easy. We were able to park both our van, truck and 40′ RV without a problem using the park loop driveway which has designated parking areas throughout. Exiting was also easy due to the loop design. Time to tour: Some may be able to tour this place in 1-2 hours, but that would require moving much quicker than we did. We were there for at least 3 hours–I guess we ask good questions ;). Prices: $8 for adults (which begins at age 13-super lame in my opinion) and $4 for kids ages 6-11. For some reason I could not find any pricing info online before we arrived so I was thankful to see that they were so affordable. There are AAA, senior and military discounts. Hours: They are open weekdays from 8:00-4:30 with the last tour beginning at 3:00.